He's a stay-at-home dad and a power in the Maryland General Assembly. 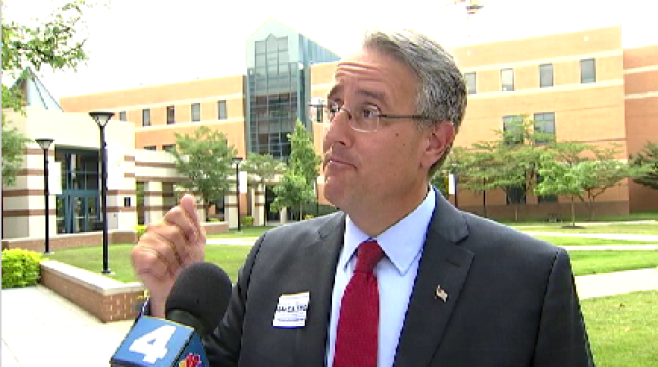 Veteran Montgomery County state Sen. Richard Madaleno is running for governor in a crowded Democratic field. News4's Tom Sherwood takes a look at the candidates. A fifth Democrat, State Sen. Richard Madaleno Jr., launched his candidacy for governor of Maryland on Monday. The veteran Montgomery County state senator announced his run for governor at the Universities at Shady Grove in Rockville, together with his family and friends. The leading Hogan critic has been a member of the Senate since 2007, after spending four years in the House of Delegates. He was the first openly gay lawmaker elected to the Senate. “Larry Hogan refuses to serve the people of Maryland, I will. Larry Hogan refuses to hold Donald Trump accountable for the damages being done to our state and to our country -- I will,” said Masaleno, as he seeks to challenge the Republican governor. He joins four others seeking the Democratic nomination, including Prince George's County Executive Rushern Baker, former NAACP president Ben Jealous, Baltimore lawyer Jim Shea and tech entrepreneur Alec Ross.